Dr. Keith Ratcliff completed his dental degree with the University of Dundee in 2014. On completion of the membership exams he became a member of the Royal College of Surgeons of Edinburgh in 2016. During his career, most recently he worked in private practice in Christchurch, New Zealand. 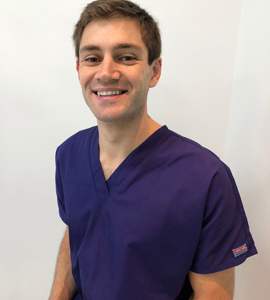 He has also held positions in the restorative department of Aberdeen Dental Hospital and in the Maxillofacial department of the Aberdeen Royal Infirmary. These varied roles have given him a breadth of clinical skills and experience across many different aspects of dentistry. Keith regularly attends continuing education courses and is currently undertaking a number of courses relating to orthodontic treatment, dental aesthetics and restorative dentistry. During his university years Keith spent most weekends hill-walking and paragliding. He now also enjoys running and cycling.